This Gorgonian anemone was photographed at Darwin Island. Some of the world’s rarest and most fragile coral reefs and the economies that depend on them will be better protected thanks to a major international marine project led by the University of Southampton. The three-year, Government-funded, Darwin Initiative project Galapagos Coral Conservation: Impact Mitigation, Mapping and Monitoring was led by Professor Terry Dawson, from the University of Southampton’s School of Geography. The research is published in a special edition of the peer-reviewed journal Galapagos Research. The aim was to assist the Ecuadorian Government in protecting the last remaining extensive Galapagos coral reefs of the northern Wolf and Darwin Islands and how they can be managed in a way that still supports the economic activities that are so important to the Galapagos Islands. The coral reefs of the Galapagos Islands contribute significantly to species richness and diversity in the Galapagos Marine Reserve (GMR). 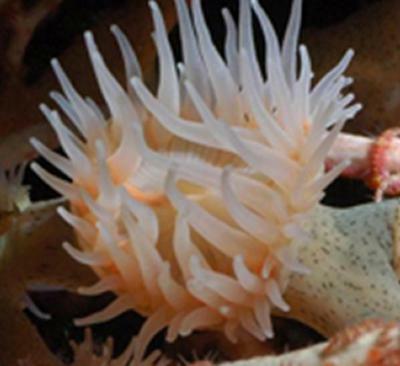 They support thousands of species, including many rare and endemic corals. In addition, these reef ecosystems are major hotspots with remarkable numbers of sharks, tuna, turtles, and dolphins all ecologically linked to the area’s reef complexes. However, their distribution has been strongly affected by extreme climatic events over the last 30 years, especially El Niño events where extensive coral reefs were reduced by 95 per cent in 1982–3, with further mortality in 1997–8 due to increased sea surface temperatures as a result of ocean warming. The project also engaged the fishing and tourism industries for improved management of the marine environment through capacity-building of tourism, dive guides and fishers, and established permanent mooring buoys to avoid boat anchor damage. Professor Dawson comments: “These significant findings greatly improve our knowledge and appreciation of the value and current condition of the Galapagos’s northerly coral communities and establish conservation measures and stakeholder commitments to protect these valuable habitats. The project also discovered new species both to science and to Galapagos, including zooanthid species from the genera Parazoanthus and possibly Epizoanthus, although the latter may be an entirely new species as yet undescribed. As well, two new species from two new genera were confirmed to also be present in the Galapagos. The three-year project is the most comprehensive study using innovative mapping and rapid assessment techniques undertaken to date in the remote northern Galapagos Islands. The project brought input from a large number of international and local marine and coral scientists, including the Charles Darwin Research Station, Conservation International, Galapagos National Park Service and WildAid, to address the particular conservation challenge faced by Wolf and Darwin Islands. Professor Dawson’s recent research was essentially a follow-on project, based upon the recommendations that arose out of research by Professor Ken Collins at the University of Southampton’s School of Ocean and Earth Science. Professor Collins was the Principal Investigator/Project leader of an earlier Darwin Initiative project that helped to develop the Galapagos Marine Park. The Galapagos Islands lie in the Pacific Ocean about 1,000 km from the South American coast and straddling the Equator. Galapagos is a province of Ecuador, and have been recognised internationally as a Man and Biosphere Reserve, and as a World Heritage Site by UNESCO.